In the world of real estate, 24 hours a day can sometimes be not enough. From meeting clients, open house, plus paperwork and marketing – It can be daunting. Oftentimes, a real estate agent can not be inside their office every day all day. No matter what there is to do in the office it is a must to go out and visit clients and show property. A real estate office in in Jackson Hole Wyoming was looking for a solution to lessen their efforts in entertaining potential clients who come into their office while they are in the field. What they wanted was to have something that can attract and entertain visiting tourists and skiers to browse and search the MLS for properties for sale in Jackson Hole. 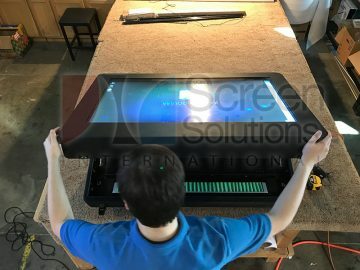 For this reason, SSI recommended the Outdoor Wall Mount Touch Screen Kiosk. It could operate not only during office hours, but 24 hours a day. The outdoor wall mount touch screen kiosk is designed for 24/7 interaction without the need for someone to staff it. The kiosk is designed to function in near any environment on earth and has fan cooling and a high brightness display. 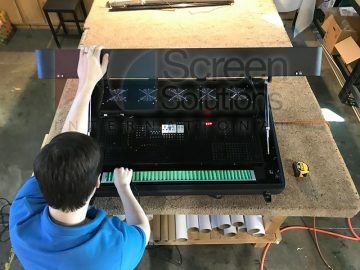 Equipped with a multitouch touch screen behind glass, rain, snow and heat are no issue and can have direct exposure without affecting touch screen or display performance. The wall mount kiosk also has theft deterrent locks that keep your technology safe and out of the reach of unauthorized hands. 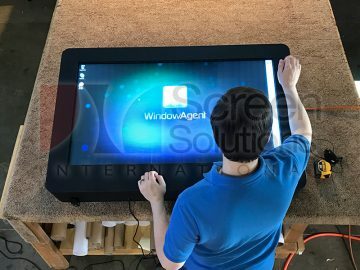 What Can The Outdoor Wall Mount Touch Screen Kiosk Do? 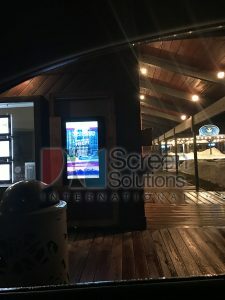 SSI presented the Outdoor Wall Mount Touch Screen Kiosk because it has 24/7 365 climate-controlled environmental protection from snow, rain, cold, heat and even vandalism and theft. 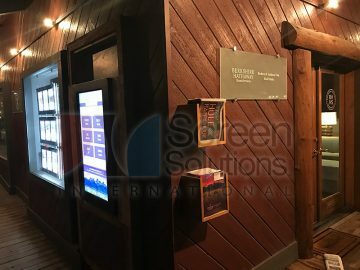 This wall mount kiosk was embedded in the storefront and trimmed out in wood paneling to match the existing architecture and decor of the office and area. Jackson Hole gets plenty of snow and freezing temperatures making the climate control a requirement so it could be used in any of the seasons year round. Standard sizes range from 32″ to 90″ and customization is available. SSI also has a full line of floor standing outdoor kiosks with or without touch screens for digital signage. Indoor kiosks are available as well for wall mount or floor standing use.